A brown dwarf, estimated to be approximately 20 times the mass of Jupiter (at left), and its companion, about 7 times the mass of Jupiter (at right) are shown in this illustration. A planet-like object has been found to be orbiting a cold,miniature star called a brown dwarf, calling into question just what it meansto be a planet. Brown dwarfs are not quite massive enough to be full-fledgedstars; they are not dense or hot enough in their cores to ignite nuclearfusion, the process that powers stars. "Brown dwarfs are nature's 'almost stars' ? gassy bodiesthat aren't quite hot enough in their cores to fuse hydrogen," said researcherKim McLeod, an astronomer at Wellesley College in Wellesley, Mass. And the new discovery of an apparent planet orbiting one ofthese ministars seems to blur the line even more between a planet and a brown dwarf. In this case, the "star" weighs about 20 times themass of Jupiter, but its planet weighs not too much less ? about 5 to 10 timesJupiter's mass. With the objects in such similar weight categories, someastronomers are questioning whether those labels even apply. "Whether this object should be called a 'planet' is upfor discussion, as it doesn't fit neatly into our current theories of planetformation," McLeod said. "Most people have a good sense of what aplanet is: it orbits a star, is big enough to have become spherical, and ? thislast bit thanks to the Pluto debate ? is enough of a gravitational bully tohave cleared out other objects from its orbital path." Another confusing aspect about this system is the apparentage of the smaller companion. The weird object appears to have formed in less than 1million years, which is the approximate age of the browndwarf. But that's much faster than the predicted time it takes to buildplanets according to some theories. "This is the youngest planetary-mass companion that hasbeen found so far, and its extreme youth provides constraints on how it couldhave formed," said co-researcher Kevin Luhman of the Center for Exoplanetsand Habitable Worlds at Pennsylvania State University. "The formationmechanism of this companion in turn can tell us whether it is truly aplanet." Scientists envision a few possible ways planets can form. Inone scenario, a disk of dust and gas surrounds a star, and that dust clumpstogether to form a rocky planet which then accumulates a shroud of gas aroundit. Another option is that a lump of gas in the disk collapses into a gaseousball to create a gas giant planet. 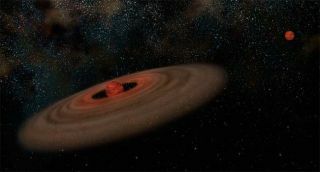 Thirdly, instead of starting from a disk, aplanet might collapse directly from a cloud of gas and dust, the same way astar or brown dwarf would form. In the case of the planet-like companion in the recentlyobserved system, researchers are favoring the third possibility because itcould explain how the companion formed so quickly. The planet-like object was spotted in observations taken bythe HubbleSpace Telescope and the Gemini Observatory telescopes in Hawaii and Chile.The researchers detail their findings in the May 1 issue of the AstrophysicalJournal Letters.